The clamour for another rate cut from the Reserve Bank of India (RBI) has strengthened with Finance Minister Arun Jaitley stepping up pressure on Governor Raghuram Rajan to cut rates, citing falling inflation. But will a quarter percentage point rate cut prompt banks to cut their rates further? The answer is probably no. Unless banks’ bad loans ease substantially and genuine demand picks up following recovery in the economy, banks wouldn’t be in a position to pass on the benefit of an RBI rate cut to the end consumer in a meaningful manner. For instance, look at the current situation: Banks have cut rates by a maximum 30 bps even though the RBI has cut rates by 75 bps so far this year. Given the factors preventing banks to cut their lending rates, another quarter percentage point RBI rate cut can hardly do any miracle. Even the central bank has repeatedly said it wants more monetary transmission by banks and even cautioned that if banks would not cut rates, they will lose out large borrowers to money markets, which is already happening. But banks are unable to heed this advice and resume lending due to the bad loans on their books and scarcity of capital. Unless these issues are resolved, a rate cut is not going to transmit to industries and end-consumer in the form of a reduction in interest costs. The asset quality situation of Indian banks has deteriorated further. The bad loans (gross NPAs) on their book is well over Rs 3,00,000 crore. The chunk of restructured loans in the banking industry will be in the range of Rs 5,00,000 crore to Rs 600,000 crore by consensus estimates in the banking industry. That’s not all. The portion of loans, where repayments have already delayed over 60 days (known as SMA-2 loans; loans that are more than 90 days overdue become NPAs), is estimated to be around 7-8 percent. What this tells us is that the stressed asset situation of banks does not looks good at all and if things don’t do well in the near future in the economy, we are staring at another round of bad loan trouble for banks. In fact, Jaitley himself has admitted that bank NPAs have shot through the roof. Speaking at an event in Delhi on Friday he said, "NPAs, which have reached to the present level are unacceptable. They reached this level partly because of indiscretion, partly because of inaction and partly because of challenges in some sectors of the economy, which were evident through the high NPA levels in these sectors." This NPA pile didn’t escalate overnight. Part of this is due to the careless lending by banks over years to grow their loan book and partly due to government-prompted directed lending to certain high-risk sectors such as agriculture. Also, besides the genuine cases, there are several wilful defaulters, who wouldn’t pay back to banks even if they have the capacity to do so. The government needs to support banks on all these fronts to resolve the bad loan scenario. If Jaitley is serious about the bad loan scenario, he should first come out with a well-thought-out plan that addresses the immediate concerns and longer-term solutions such as creation of an effective bankruptcy law. Also, government must put its weight behind banks to chase large wilful defaulters. The recent package announced by the government to revive state-run banks didn’t have a concrete plan on bad loan management. As per data obtained from the All India Bank Employees Association, there are 7,035 cases of wilful defaulters that have bad loans to the tune of Rs 58,792 crore as on 31 March 2015. The point here is that with this kind of stress on their balance sheets, banks are least enthusiastic to lend more to industries, which are struggling with the debt load. Many large companies are, therefore, shifting to cheaper money market to raise funds. But for smaller firms this isn’t possible. Hence, even an RBI rate cut wouldn’t prompt banks to cut rates further, beyond what they have already done. Secondly, even though the willingness from the government to infuse capital to the tune of Rs 70,000 crore by 2018-19 into public sector banks is a positive step, this might prove to be too little for banks to overcome the current NPA problem. "The Central government's planned capital infusions come at a good time for public sector banks. But they don't go far enough," Standard & Poor's credit analyst Amit Pandey said. Of the Rs 70,000 crore, as much as Rs 25,000 crore would be injected in the current fiscal. Besides, the government wants PSU banks to raise an additional Rs 1.10 lakh crore from the markets in the next four years. But the pressure on asset quality front would make it difficult for banks to go on their own to the market and raise funds. Unless money is available, credit expansion would be difficult. 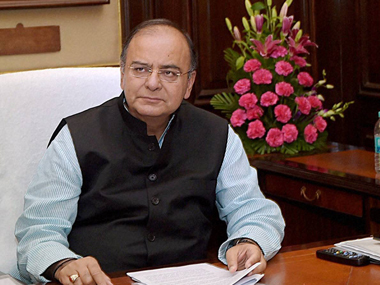 Third, Jaitley should note that unless the economic recovery picks up sharply, a rate cut alone wouldn’t be sufficient to improve the corporate performance. The government should act fast on solving problems faced by infrastructure projects, which are stuck for long. 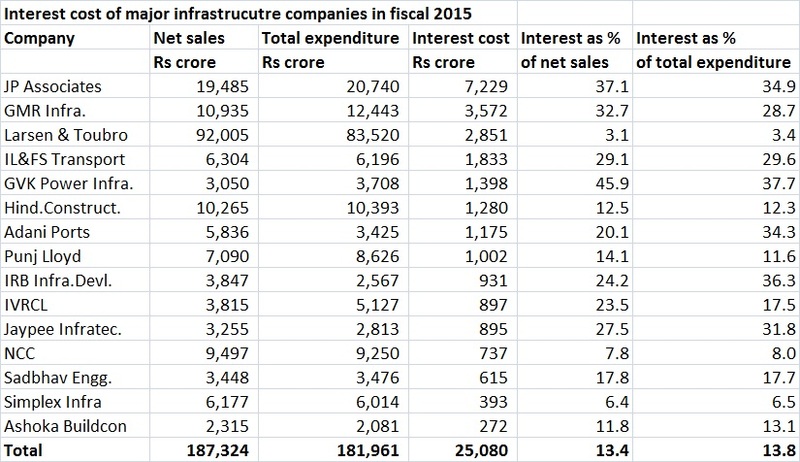 A Firstpost analysis of 15 infrastructure companies show that interest cost, as a percentage of total cost, constitutes only about 13 percent on an average. The government can do better to help these firms by fast-tracking reforms and clearance processes aiding faster project execution. Interest cost constitutes only a part of the overall burden. An RBI rate cut is likely to happen by September or even before that if inflation stays low, but it is unwise to expect that rate cut would offer any major relief to companies, especially smaller ones. The bottomline is this: the fundamental problem that prevents banks from resuming credit expansion to industries is not RBI rate cut, but the huge bad loans on their books and capital constraints. The solution to this problem lies in kick-starting the economic engine and the recovery of bad loans. An RBI rate cut is not much use otherwise. A great mind making up the loss -- at least about Rs 8300/- cr on useless account like OROP. How about presenting a zero deficit budget by disbanding the Indian armed forces and saving so much on defence that you are sure to be declared the greatest FM of India. A Bharat Ratan!!!! !